Generally, we have found that Millionaire households tend not to go hog wild when it comes to holiday spending, whether it be St. Patrick’s Day or even New Year’s Eve. But holidays rooted in family and faith are a different story and that’s when they tend to put their money where their hearts are. Mother’s Day is second only to the winter holiday season as the nation’s biggest retail holiday, according to the National Retail Federation. Our new Investor Pulse survey finds that the highest percentage of Millionaire and Ultra High Net Worth households (roughly one-third) plan to spend between $51 and $100 on mother this Mother’s Day. Sixteen percent of Millionaires with a net worth up to $5 million (not including primary residence) will spend between $101 and $200, while 20 percent of UHNW individuals with a net worth between $5 million and $25 million will spend that amount. Twelve percent of these elite investors look to spend more than $200. Beyond net worth, we conducted research among Affluent households to examine Mother’s Day spending trends. Mothers reading this might hope that their children are married. Couples are more likely to spend the most on Mother’s Day than their single counterparts. For example, 18 percent of respondents who are married plan to spend between $101 and $200, compared with 13 percent of respondents who are single. Conversely, Seventeen percent of those who are not married will spend between $1 and $24, vs. 12 percent of those who are married. 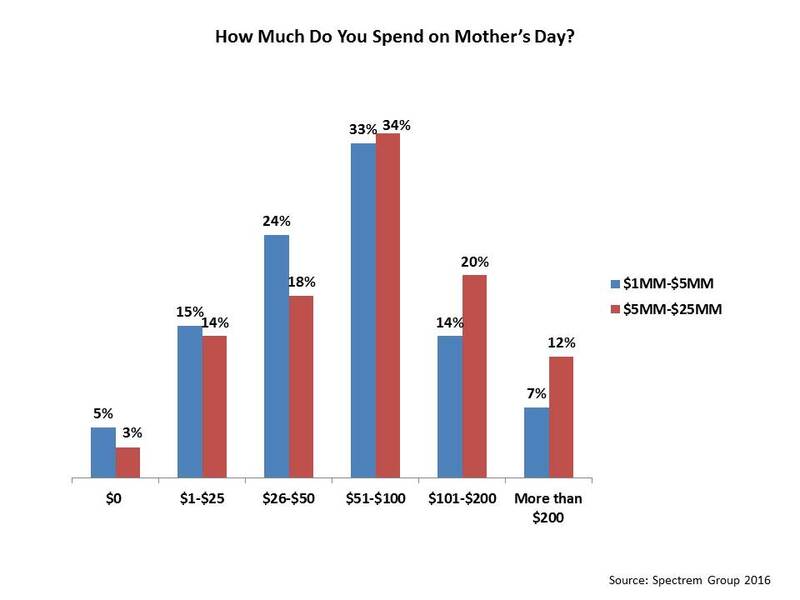 Is there a correlation between Mother’s Day spending and financial knowledge? The jury is out on this one. While the likelihood of spending between $1 and $24 increases and professed financial knowledge decreases (from 12 percent of those most confident in their knowledge to 18 percent of those who admit to having little or no financial knowledge), the highest percentage across all financial knowledge levels report they will spend between $51 and $100 on mom this year. Likewise, age is not a significant factor in who plans to spend $101-$200 or even more than $200, It is also nice to report that Mother’s Day spending cuts across all lines of political affiliation, with 15 percent of respondents who identify as Republican indicating they will spend between $101-$200 along with 13 percent of Democrats and 16 percent of Independents. And that is this money spent on? Cards, mostly, Four-in-ten Millionaires and one-third of UHNW plan to get one. Three-in-ten of both wealth segments plan to take their moms out to dinner, while one-in-five plan to go the brunch route. As to gifts, the highest percentage of Millionaires (42 percent) and UHNW individuals (37 percent) will get mom flowers.